Lightweight, LONG SLEEVE PULLOVER JACKET. This material is DWR (water resistant and stain resist- ant). Sueded for a very soft hand. Jet dried. Features include: Side seamed pockets, colorblock sides with matching ribbed waistband collar and cuffs. Lined in Moch Mesh moisture management material. Great for golfing, team sports or corporate casual wear. Avail- able in many fabrics and linings and colors. Call for details. Made in USA. This fabric is widely used for golf shirts, and that’s exactly how we use it. 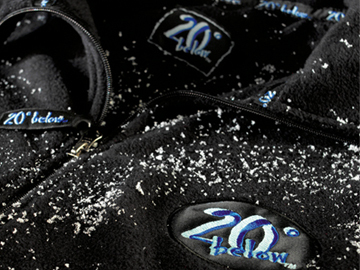 Suede Micro Fiber is super soft, doesn’t need to be lined, and is great for keeping the wind out. This fabric is 100% Polyester Micro Sanded and has a durable water repellent (DWR) finish.